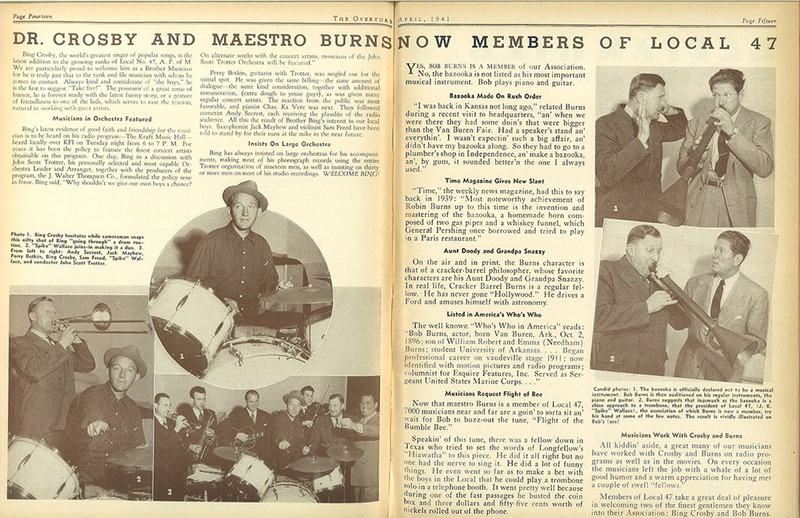 Members of Local 47 take a great deal of pleasure in welcoming two of the finest gentlemen they know into their Association: Bing Crosby and Bob Burns. Bing Crosby, the world’s greatest singer of popular songs, is the latest addition to the growing ranks of Local No. 47, A. F. of M. We are particularly proud to welcome him as a Brother Musician for he is truly just that to the rank and file musician with whom he comes in contact. Always kind and considerate of “the boys,” he is the first to suggest “Take five!” The possessor of a great sense of humor, he is forever ready with the latest funny story, or a gesture of friendliness to one of the lads, which serves to ease the tension, natural in working with great artists. Perry Botkin, guitarist with Trotter, was singled out for the initial spot. He was given the same billing—the same amount of dialogue—the same kind consideration, together with additional remuneration, (extra dough to youse guys), as was given many regular concert artists. He reaction from the public was most favorable, and pianist Chas. Ka Vere was next. Then followed cornetist Andy Secrest, each receiving the plaudits of the radio audience. All this the result of Brother Bing’s interest in our local boys. Saxophonist Jack Mayhew and violinist Sam Freed have been told to stand by for their turn at the mike in the near future. Bing has always insisted on large orchestras for his accompaniments, making most of his phonograph record using the entire Trotter organization of nineteen men, as well as insisting on thirty or more men on most on his studio recordings. WELCOME BING! Yes, Bob Burns is a member of our Association. No, the bazooka is not listed as his most important musical instrument. Bob plays piano and guitar. On the air and in print, the Burns character is that of a cracker-barrel philosopher, whose favorite characters are his Aunt Doody and Grandpa Snazzy. In real life, Cracker Barrel Burns is a regular fellow. He has never gone “Hollywood.” He drives a Ford and amuses himself with astronomy. Speakin’ of this tune, there was a fellow own in Texas who tried to set the words of Longfellow’s “Hiawatha” to this piece. He did it all right but no one had the never to sing it. He did a lot of funny things. He even went so far as to make a bet with the boys in the Local that he could play a trombone solo in a telephone booth. It went pretty well because during one of the fast passages he busted the coin box and three dollars and fifty-five cents worth of nickels rolled out of the phone.